Jane Cheney, Countess of Southampton (d.15 September 1574) was the daughter and heiress of William Cheney of Chesham Bois, Buckinghamshire, by Emma Walwyn, daughter of Thomas Walwyn. Jane married to Thomas Wriothesley (21 December 1505-30 July 1550), the son of York Herald, William Wriothesley and Agnes Drayton, daughter and heiress of James Drayton of London. Thomas Wriothesley was held in high favor with King Henry VIII. However, he would become one of the members of the Catholic faction that tried to arrest Queen Katherine Parr. As Jane was a member of Parr’s household, one wonders what she would have thought when her own husband was reprimanded for trying to serve an arrest warrant to the Queen while she was sitting in the garden enjoying an afternoon with the King. Wriothesley was not met with a warm reception and was yelled at by the King for such behavior after the two had been reconciled on the matter at hand. The couple had several children; three sons and five daughters. Sadly, the first two sons died and only the third survived; Henry. Henry was christened on 24 April 1545 at St. Andrews in Holborn. One of his godfather’s was the King, who was represented by Sir William Parr, 1st Earl of Essex (brother of the current Queen, Katherine Parr). His other godfather was the Duke of Suffolk and his godmother was the Lady Mary. Jane brought up her children in the Catholic faith and that may have hindered them. The eight thousand acre, Beaulieu Abbey, was acquired by the Wriothesley family in 1538. Another monastic estate granted to the family was Titchfield in Hampshire where the principal family home was located. Jane was fashionable and had the luxury of jewels due to her husband’s status. In her will is described a fine jewel, ‘a brooch of gold set with an agate and four little rubies [and] there is a picture of a face upon the agate.’ Cameos were popular, especially for queen’s like Katherine Parr who can be seen wearing a girdle of them in her large portrait in the National Portrait Gallery. Jane outlived her husband who died on 30 July 1550. Her son, who was still a minor at the time of his father’s death, became the ward of William Herbert, 1st Earl of Pembroke, husband of Lady Anne Herbert (sister of the late Queen Katherine Parr). 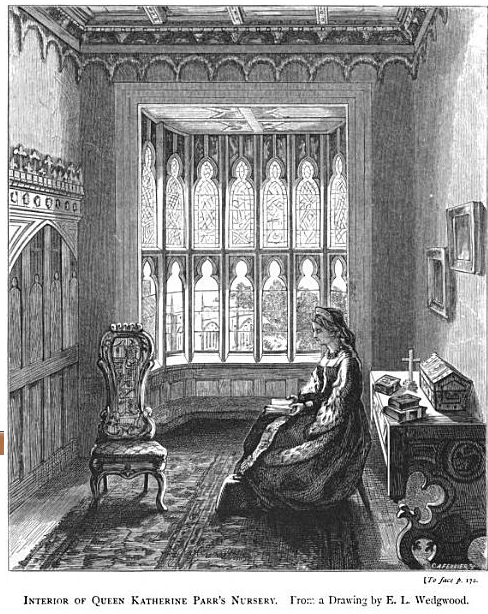 As a widow, Jane inherited manors in Hampshire like Titchfield and Southampton House in Holborn. Jane died on 15 September 1574 and she was buried in Titchfield, Hampshire where her effigy can be seen. Susan James. The Feminine Dynamic in English Art, 1485-1603 : Women as Consumers, Patrons and Painters. Google eBook. Akrigg, G.P.V. (1968). Shakespeare and the Earl of Southampton. Cambridge, Massachusetts: Harvard University Press. Dorothy Bray, Lady Chandos of Sudeley (c.1524-31 October 1605) was the daughter of Edmund, 1st Baron Bray (1484-18 October 1539) and Jane Hallighwell (c.1480-24 October 1558). She was at court as a maid of honor to Anne of Cleves, Catherine Howard and Katherine Parr. She embarked upon a brief tryst with Sir William Parr, brother of the future queen c.1541, which was over by 1543. Parr’s wife, Anne Bourchier, heiress to the Earl of Essex, had already left their marriage and embarked with her lover and had children by him, so Parr was left behind. Parr’s interest was then diverted to Dorothy’s niece, Elisabeth Brooke. Dorothy married Edmund Brydges, 2nd Baron Chandos (d.11 September 1573) and their children were Eleanor (b.c.1546), Giles (1547-1594), Mary, Katherine (1554-1596), and William (d. 1602). Dorothy was at court as Lady Brydges during Mary Tudor’s reign. In 1574, Queen Elizabeth visited Lady Chandos at Sudeley Castle. In 1588, she was living in Essex House in London and had 220 books in her bedchamber there. Dorothy’s second husband was a younger man, Sir William Knollys (1545-1632). Dorothy was known among courtiers as “old lady Chandos”. Unfortunately, her husband fell in love with one of the queen’s maids of honor, Mary Fitton. During that time, Dorothy was living with him in a house adjoining the royal tilt yard (Violet Wilson. Queen Elizabeth’s Maids of Honor and Ladies of the Privy Chamber). Dorothy’s daughters, Eleanor and Katherine, and eventually her granddaughters, Frances and Elizabeth Brydges, would also become maids of honor. Portraits: The “Duchess of Chandos” attributed to John Bettes the Younger, 1578, could be Dorothy Bray, although the sitter looks very young for someone who would be around fifty-four years old at the time. Dorothy’s effigy appears with her second husband in the church at Rotherfield Greys, Oxfordshire. Kathy Lynn Emerson. A Who’s Who of Tudor Women. Mary Wotton (1499-17 September 1558) was the daughter of Sir Robert Wotton of Boughton Malherbe, Kent (1465-1524) and the heiress, Anne Belknap. By her sister, Mary was the great-aunt of Lady Jane Grey. The Wotton family were merchants from London. The Wottons seemed to have suffered as a result of the War of the Roses, but seemed to survive and come out on top afterwards like the Howards, Carews, etc. At one time, Sir Robert was Controller of the Royal Household. He also received the Order of the Garter. Mary’s brother, Nicholas, was a diplomat and Ambassador to France to Queen Mary. Her nephew, Sir Henry, was also a diplomat and a poet. Her sister became Marchioness of Dorset and eventually Duchess of Suffolk. Wotton may have been the Mistress Wotton who was a chamberer to Mary Tudor, queen of France, in 1513. She married first, as his second wife, Sir Henry Guildford (1489-1532) and was his executrix. Guildford was long associated with Sir Nicholas Carew so that may explain how the eventually widowed Lady Guildford married secondly to a Carew. Mary, as Lady Guildford is listed as being one of the ladies who performed in a masque at the elaborate banquet that took place after the signing of the Treaty of Universal Peace with the French Ambassadors. The entertainment was lead by the King himself and his sister, the French Queen. At that time, Mary, Lady Guildford, was listed as part of the household of Queen Katherine of Aragon. Other ladies listed are Lady Carew, Elizabeth (Bessie) Blount, and Lady St. Leger. Wotton appeared quite frequently at court and probably lived there. According to Susan James, Lady Carew (previously Lady Guildford) was a veteran at court who had known Katherine’s mother, Lady Maud Parr. The family connections were strong as the Parrs were already connected to the Guildford family. Lord Guildford was the son of Joan Vaux, sister of Sir Nicholas Vaux. After the death of Lord Parr in 1483, the widowed Elizabeth, Lady Parr, remarried to Sir Nicholas Vaux. Vaux became stepfather to the future Queen Katherine’s father, Sir Thomas. As for the Carews, Sir Thomas and Maud were friends with them while they were at court during the reign of Queen Katherine of Aragon. Several of the Carew family members would be placed within the household of Queen Katherine Parr including Wymond Carew who became the Queen’s treasurer. Apparently, along with her mother-in-law, Lady Jane Guildford, and her sister, the Marchioness of Dorset, she was one of the most prominent women at court in the 1530s. After Guildford died, she continually wrote to King Henry to receive some sort of help, referring to herself as a “poor widow”. She received a release from all her obligations to the king on March 25, 1533 but was still deeply in debt in 1535 when she wrote to Lord Cromwell on the subject. Her second husband, married in July 1540, was Sir Gawin Carew of Exeter and Wood, Devon (c.1503-1583). Mary was the second of his three wives. Gawin was the fourth and youngest son of Sir Edmund Carew. He was a Protestant and was devoted to the cause. When Anne of Cleves arrived, he was tasked with receiving her. We find that Sir Gawin was a Navy man and was in command of the ship Matthew Gonson during 1545. The ship was 500 tons and contained 300 men. As Lady Carew, she lived at Wood Barton, but was obviously frequently at court as she went on to attend Queen Katherine Parr and was part of her inner circle. Perhaps Mary was even given apartments again. The appearance of Mary is not described anywhere, but from the complaints of King Henry we can tell that Queen Katherine’s ladies were not much to look at. Perhaps their daily clothing did not help enhance their beauty; if they were beautiful. It was probably to the Queen’s credit that she kept her ladies in subdued colors and didn’t flaunt them like other consorts did. Queen Katherine had seen what happened to Henry’s other wives and probably didn’t want a repeat of what happened before she became Queen. Along with Lady Herbert, Lady Lane, and Lady Tyrwhitt, Lady Carew was tasked with assisting the Queen on her first Maundy Thursday activities (1544), where the Queen performed her duty of washing the feet of poor women. When Katherine published her book, Psalms or Prayers, Mary and the inner circle of the Queen were included as recipients of the book. Lady Carew died on 17 September 1558. She is buried in the Church of Kentisbeare in the Whiting Chapel. Her effigy is not present, but can be seen on the monument of her husband, Sir Gawen Carew in the Chapel of St. Mary Magdalene in Exeter Cathedral. For more on her tomb and memorial, see here (Memorials of the West). Barbara Harris. English Aristocratic Women, 1450-1550: Marriage and Family, Property and Careers. Google ebook. Susan James. Catherine Parr: Henry VIII’s Last Love. God love that Pinterest, but did I read that correctly? The woman in the middle is Margaret Douglas? Wasn’t that identified as Queen Katherine Parr in 1965 and then again in 1996? So where does the Margaret Douglas identity come from? Pinterest, the new online addiction for millennials. Pinterest is a website where you can “pin” photos online to a virtual “board”. I was merely looking for a picture on the web and did an image search. I noticed that several of my articles photos popped up. So, why is this website using my photo? Welcome to Pinterest! The rest is history! Pinterest can be your best friend or your worst nightmare, depending on who you are. If you’re a historian, like me, it’s a complete mess! Portraits are mislabeled, facts are not true, the link that provided the photo has disappeared yet the photo remains, etc. Most people catch on and realize that they can indeed change the caption that is mindlessly being re-pinned onto other boards. Yes, when you Pin something, the caption (in this case, the wrong one) doesn’t change unless you manually do it. So…we find portraits from the Tudor era that have been incorrectly identified and re-pinned hundreds of times! Oh, my head! I have been wanting to write something on Pinterest for a long time; about the relentless misidentified Tudor portraits. Well, this final pin has my full attention. The pin is right in the middle of the screen cap above. It seems that someone pinned the portrait “Katherine Parr” from a website that identifies the portrait as “Margaret Douglas”. Confused? Me, too! So I thought I would check out the website and boy did I get more than I bargained for! And to that, I reply “au contraire mon fraire”!! In an earlier article I did in March of 2013, I studied the portrait that has actually been long associated with Lady Jane Grey; grandniece of King Henry VIII by his other sister Queen Mary of France (Duchess of Suffolk). Surprisingly, through research, I learned that the original portrait came to the Portrait Gallery in 1965 as “Katherine Parr”. Following research published in 1996, the identity of the sitter has been reassessed and the traditional identification of the sitter as “Katherine Parr” has been re-confirmed (James, 1996). Several of the jewels worn in the portrait can be traced to certain lists. James used several different inventories of jewels belonging to queens Katherine Howard (inventory as of 1542), ‘The Quene’s Jewells’ (inventory as of 1550), and a third undated list entitled “Inventory of jewels — parcel of the Queen’s Jewels and other stuff which came from the late Admiral’s [Thomas Seymour] house of Sudeley.” The 1542 list is of particular interest due to the fact that after Howard was arrested, her jewels were handed over to her lady-in-waiting, Lady Anne Herbert (sister of the future queen Katherine Parr). The list of 1550 was ordered by the Lord Protector as part of a comprehensive inventory of the ‘goods of Henry VIII.’ This list was entitled “The Quene’s Jewells.” Each list was looked at by James. The coronet shaped brooch was not found in the list for 1542. However, a similar one was described in the 1550 list and that of Parr’s possessions. The brooch may be identified with one described in the 1550 jewel list as, an ‘ouche’ or ‘flower’ was a brooch worn pinned to the bodice. Detail of “Queen Katherine Parr”; NPG 4451. Let’s look at the portrait of Margaret Douglas. Her costume is the only tool to date the painting. It was in fashion around 1528 to 1535. Jane Grey was born in 1537. She was not even born when this portrait was made. Therefore we can rule her out. Katherine Parr got married to her second husband John Neville around 1530/1531. She married the English King Henry VIII in the year 1543. And in 1543 she was already a woman of the age of 31 years. Does this young woman (15 – 20 years old) look like 31 years old? We are in the Renaissance! Do you have any idea what a woman looked like when she was 30 years old? The fashion tells us that the depicted on the portrait cannot be Katherine Parr. The portraits of Katherine Parr also tell us the depicted on this portrait can not be Katherine Parr. Margaret Douglas and her cousin Eleanor Brandon were the favourite nieces of Henry VIII (at least in the beginning of the 1530s). Margaret Douglas and Eleanor Brandon both received a specific piece of jewellery *(a necklace) from him which he also gave – according to Susan James – to his new bride Katherine Parr in 1543. The two specimens of these *necklaces of Margaret Douglas and Eleanor Brandon look almost the same, but there are small differences. Susan James was therefore not very well informed when she made her claim that the depicted is Katherine Parr. *The now PUBLIC email that Ms. Vogt-Luerssen published on her site differs from her original printed here after I responded to THIS email. However, let us examine this email and pick it apart. The argument against Katherine Parr holds no sustenance. Ms. Vogt-Luerssen questions as to how the painter actually knew who the sitter was. Well, for one, the sitter was actually present when the portrait was done. Ms. Vogt-Luerrsen then goes on to say that the fashion worn in the portrait pertained to only 1528-1535. Pretty sure that no one wore that style of clothing during that supposed time period. Let’s see, Katherine of Aragon was still the Queen of England in 1528. In fact, her title wasn’t taken away until 1533. So, no, that was not the fashion at the time. Even when Mistress Anne Boleyn started to emerge at court, her style, as drawn by Holbein in 1532-35, stayed relatively the same. Anne was more in tune with the fashions of the French Court, but she is still seen wearing the Gable Hood, even in the most authentic depiction that we have of her. As for Katherine of Aragon’s fashion, she was known for her specific style of clothing that included the Gable. She also introduced the Spanish Farthingale which would become popular later on in the reigns of Katherine Howard (1540-41) and Katherine Parr (1543-47). The appearance of the fashion in the portrait of Katherine Parr appears to have become documented and portrayed in portraiture in the 1540s. Katherine Parr was known for her love of fashion. In fact, Parr and the Lady Mary (daughter of Katherine of Aragon) bonded over their clothing. The two were always wearing the latest fashions. Katherine made it known that she preferred Spanish relations to the French. Katherine was keen on presenting the Lady Mary above all. The two were constantly seen together. Detail of the NPG portrait of “Queen Katherine Parr“. I’m not sure where you are getting your info. I have researched this issue thoroughly since Susan James’s book came out in 2009. Your theory is based off your own opinions. There are no concrete sources listed in your argument. I can list over a dozen that prove that the portrait IS Katherine. Katherine married Henry in 1543. The portrait was done circa 1545. Margaret Douglas was a lady to Queen Katherine. And in England, Margaret Douglas was not treated to any type of special kind of attention. Margaret held no rank that would have put her above the Queen. In fact, Margaret was behind several women. Under Henry VIII’s succession act, she wasn’t even named as a successor. She was merely a daughter of Queen Margaret and her noble husband–not even a Princess! Henry cut any ties to his Scottish family. Check records for the time–was there a portrait commissioned by Henry VIII for his niece? Not that I know of. You have anything? And any sources saying Henry gifted a specific necklace to Margaret; description and all? How can you deny the research that was done by the NPG? The portrait came in as “Katherine Parr” and was challenged. Due to research done by Susan James, the portrait was returned to the ORIGINAL identity of Katherine Parr in 1996. Dr Susan James came out with a SPECIFIC study on this portrait — identifying it as Katherine Parr. Her sources were the lists of jewels worn by the Queens of England and Katherine Parr’s inventory. There is NO study that identifies this portrait as Margaret Douglas. There are no sources that even propose the portrait to be Margaret! The portrait was actually done circa 1545. Jane Grey had NO access to the specific jewels in question. Even Margaret Douglas would have NO access to those jewels. Pretty sure Margaret was lower than Lady Jane in status due to Henry’s succession act. Also, Jane would have been extremely young if she was painted in 1545 (you say she wasn’t born under your date of when the portrait was done). When Susan James focused on changing the identity BACK to Katherine Parr, she used the brooch Katherine is wearing in the portrait. Also, Margaret Douglas wouldn’t be wearing such rich clothing and jewels as a lady in waiting. Katherine was always the top lady when it came to fashion (along with Lady Mary Tudor, later Queen). Margaret’s full length portrait done later in full black is basically what Katherine Parr had her ladies wear along with Parr’s Royal emblem. As for dates, Katherine Parr was still married to Edward Borough in 1531. She didn’t marry Latimer until 1534! On the argument of her age–does the portrait of Lady Mary look like a woman only a few years younger than Katherine? The half length portrait was painted around the same time (c.1543/45). The NPG also did a long exhausting study on that portrait also done by Master John. That portrait is listed as being commissioned in actual records. In infrared reflectography it is clear that the hairline has been raised, the face made slightly fuller along the left-hand side, and the position of the nose altered. The headdress has been drawn in a sketchy manner.” This was found by infrared reflectography. The original portrait done by Master John was altered — most likely an attempt to preserve the portrait. There were some extra marks around the eyes in Katherine’s portrait. You have no concrete sources. You are asking me to look at your portraits that you have compiled. There is no link to any source except your own site which states it’s Margaret. I don’t read German, however my brother is fluent. Going against actual biographers such as Dr Susan James, Linda Porter, Dr David Starkey, the curators at the National Portrait Gallery in London, the curators at Sudeley Castle, and the many sources available is ridiculous. The labeling of the portrait as Margaret is not correct; the facts that have been presented by ACTUAL historians label the portrait as Katherine Parr. I’ve been studying Katherine Parr for over a decade! A historian who works on the identity of portraits claimed to be Jane Grey, Dr Stephan Edwards, has his own pages that state that the portrait is Katherine. This portrait has been thoroughly studied and Margaret was NEVER even brought up as a possible sitter! It was between Katherine Parr and Jane Grey. Again, Margaret had her own full length portrait done much later on. This portrait of Katherine Parr looks NOTHING like Margaret’s other portraits. Here are some actual links that state WHY the portrait is Katherine Parr. A lot of research and work was done to positively identify this portrait as Katherine Parr and hopefully you can put down the ego and open your mind on this subject. From Dr Edwards: “Susan James convincingly re-identified NPG 4451 as Katherine Parr by comparing the bodice brooch to items described in inventories of the jewels owned by Henry VIII’s wives, including Parr. The brooch is unique as James suggests and the sitter in NPG 4451 is indeed Katherine Parr.” Would you like me to send you Parr’s inventory and the queen of England’s jewel inventory which was held by Lady Anne Herbert (sister of Queen Katherine)?? This is the subject of the so called debate in which I revealed to Ms. Vogt-Luerssen that the portrait was indeed “Katherine Parr” based on the studies done by the NPG and biographer Dr Susan James. Many sources were attached to this email response. Shortly after, I found that the woman actually published my private email on her public site. Fine, game on. What really made me angry about the publishing of a private email was the fact that this woman, Ms. Vogt-Luerssen, took MY own words (research, see below) from this reply and inserted them into her refutation on her site. What words did Ms. Vogt-Luerssen replace with MINE? A few paragraphs back, I made sure to highlight words in RED. And now, I have a side by side comparison of the email to Ms. Vogt-Luerssen’s page on “Margaret Douglas”. The discrepancies of the email and what is posted on the actual LIVE site. On the left, is the original email from Ms. Vogt-Luerssen [photo still taken by my Iphone]. On the right, is the actual website in which she took my research and information (about the brooch) to make her own “research” seem legit. Again, no sources and no portraits of Margaret Douglas and Eleanor Brandon to prove either claims in these two highlighted sections (necklace OR brooch). You also have Ms. Vogt-Luerssen calling Dr. Susan James, a well known biographer of Katherine Parr, “not well informed”. To my knowledge, James has had the most experience when it comes to researching Katherine Parr to this date. Ms. Vogt-Luerssen now has FALSE information on her website. She has been confronted by several people; including some Doctoral Scholars who are well known in the Tudor community. So, the cat is out of the bag so to say. This is ONE of several issues this woman refuses to fix on her website. Her reputed knack for identifying Tudor portraits (by opinion only) is horrific and goes to show what passes as “Historical Accuracy” online. I have had conversations with several Tudor scholars on this and the final conclusion is that Ms. Vogt-Luerssen is not a Historian and IS a hack trying to sell her own compilation of opinions and ill research. And to boot, she has written a “non-fiction” book called, The Women of the House of Tudor – The fate of female members of an English royal dynasty,which she points to at every mention she can. Follow ups to the other vital mistakes will be linked to here. Dr Stephan Edwards. “A Queen of a New Invention: Portraits of Lady Jane Grey Dudley, England’s Nine Days Queen“, 2015. Old John Publishing. Susan James. “Catherine Parr: Henry VIII Last Love“, The History Press, 2009. Linda Porter. “Katherine the Queen: The Remarkable Life of Katherine Parr“, Macmillan, 2010. Janel Mueller. editor. “Katherine Parr: Complete Works and Correspondence“, University of Chicago Press, 2011. Amy Licence. “The Six Wives & Many Mistresses of Henry VIII: The Women’s Stories“, Amberley Publishing, 2014. Williams, Neville (1971). Henry VIII and His Court. Macmillan Pub Co.
British Library Additional Manuscripts 46348, ‘The Quene’s Juelles’, f. 168r: ‘Item one ouche [i.e., brooch] or flower with a crown containing two diamonds, one ruby, one emerald. The crown being garnished with diamonds and three pearls pendant’. Transcribed by Susan James as Appendix V to Kateryn Parr: The Making of a Queen (Aldershot: Ashgate Publishing, 1999), 423. Queen Katherine Parr: Pregnant, At Last! Katherine Parr (Deborah Kerr) and Lord Seymour (Stewart Granger) in “Young Bess” (1953); A Metro-Goldwyn-Mayer Picture. In December of 1547, Queen Katherine Parr became pregnant for what most people believe to be the first time by her fourth and final husband, Sir Thomas Seymour. After four husbands and twenty years of marriage, Katherine was about to fulfill what she felt was the primary duty of a wife, to give birth to a healthy baby; boys being preferred in aristocratic circles. Like today, some titles still cannot be inherited by the eldest or only daughter of a peer; meaning a girl cannot inherit the title of her father which is usually then passed to the closest living male relative, that being usually an uncle or cousin. 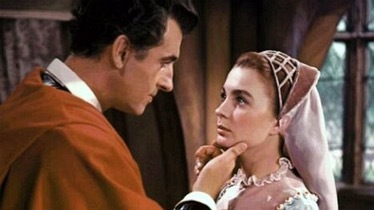 Katherine Parr (Deborah Kerr), Lord Seymour (Stewart Granger), and Lady Elizabeth (Jean Simmons) in “Young Bess” (1953). Queen Katherine found pregnancy difficult. She still had an on-going feud with her brother-in-law, the Lord Protector and his rather nasty wife, had morning sickness, was constantly worrying about her step-daughter Lady Elizabeth, and the temper of her husband and lack of discretion towards his feelings for Lady Elizabeth must have made the early months of pregnancy extremely hard for the Queen Dowager. In 1549, after the death of the Queen, two cramp rings for use against the pains of childbirth and three pieces of unicorn horn, sovereign remedy for stomach pains, were found in the chest of Katherine’s personal belongings which were talismans most likely from her husband and friend’s to alleviate the pains of childbirth and anticipated pangs of childbirth. Katherine was almost thirty-six, an advanced age to begin a pregnancy. The emotional strain of her household with Seymour’s infatuation with Lady Elizabeth couldn’t have helped her early months either. As Katherine’s pregnancy progressed, her involvement in politics, if not her interest, diminished. She viewed her approaching motherhood with delight despite knowing the risks and the possibility that death in child birth was a very real possibility. 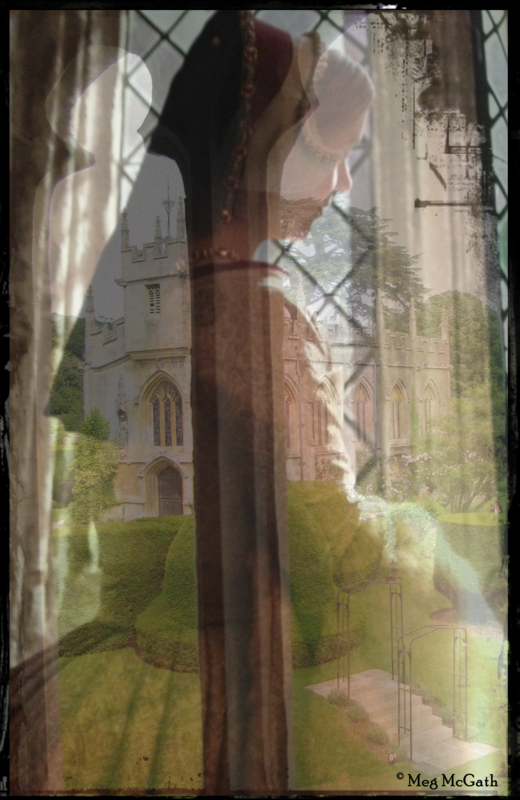 Compiled digital art featuring Hampton Court’s Katherine Parr over looking the gardens and Chapel on the grounds at Sudeley Castle. © Meg McGath, 2012. Seymour decided that Katherine should be confined as far away possible from the press of business and turmoil of the court as well as the summer plagues of London. Katherine was taken to Sudeley Castle in Winchcombe, England, outside of Cheltenham. The castle has a long history stretching back to William de Tracy. Richard III used the castle as campaign headquarters during the Battle of Tawkesbury; in which Katherine’s grandfather fought. Upon the death of Richard III, the castle reverted to the crown and new monarch, Henry VII; who gave the castle to his uncle, Jasper Tudor. After the death of Jasper Tudor, Sudeley reverted to the crown again, to King Henry VIII. In fact, the King made a visit to the castle with Anne Boleyn in 1535. Upon the ascension of Edward VI, Sir Thomas was created Lord Seymour of Sudeley and was granted the castle. In preperation for her lying-in, Seymour spent 1,000 pounds having the rooms prepared for her in his newly aquired house at Sudeley in Gloucestershire. With beautiful gardens and walks, the castle would have been a perfect place for Katherine to spend the last three months of her pregnancy. 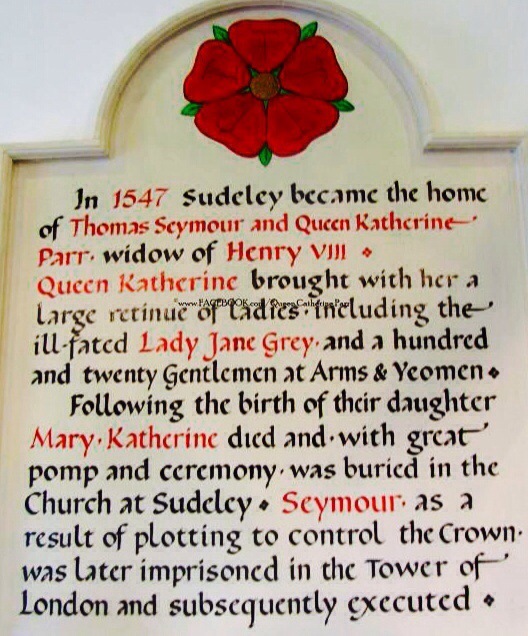 One of several plaques on the wall in the exhibit for Katherine Parr at Sudeley. © Meg McGath, 2012. 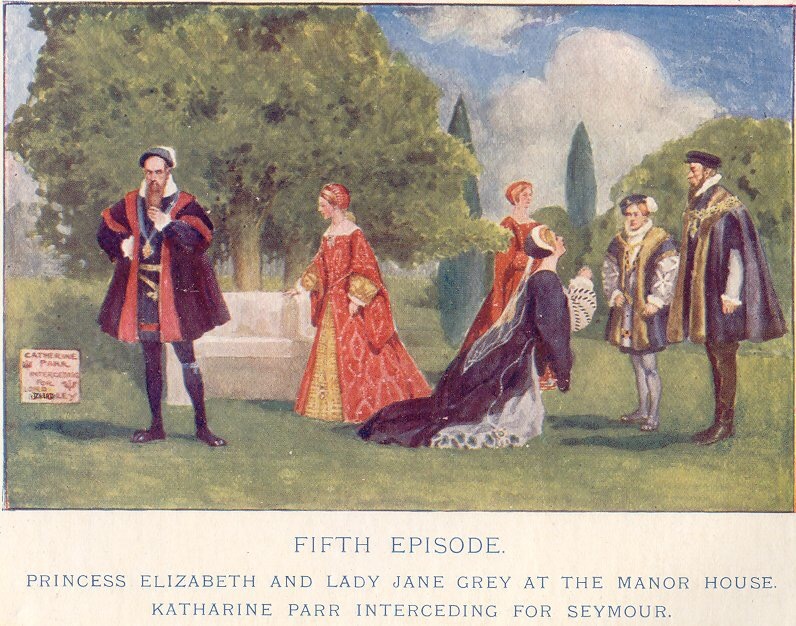 On Wednesday, 13 June 1548, Seymour accompanied his wife, who was now six months pregnant, and his young ward, Lady Jane Grey, from Hanworth to Sudeley Castle in Gloucestershire. Lady Elizabeth Tudor had been sent away that Spring so she did not accompany them. In this castle, Katherine spent the last three months of her pregnancy and the last summer of her life. Typical of Queen Katherine, she spared no expense when it came to attendants. She was attended by her old friend and doctor, Robert Huicke, and was surrounded by other old friends, Miles Coverdale, her chaplain, her almoner, John Parkhurst, Sir Robert Tyrwhitt, and the ladies who had been with her over the years such as Elizabeth Trywhitt and Mary Wodhull. Katherine also had a full compliment of maids-of-honour and gentlewomen as well as 120 gentlemen and yeomen of the guard. In spite of his duties, Sir Thomas Seymour seems to have spent most of that summer with his wife. Katherine whiled away her summer days overseeing the education of Lady Jane Grey while preparing for her baby. Her affections for her husband seemed as strong as ever, as was her belief in the final analysis, Seymour would make the moral choice over the immoral one. The nursery at Sudeley Castle. Besides the baby’s cradle was a bed with a scarlet tester and crimson curtains and a separate bed for the nurse. 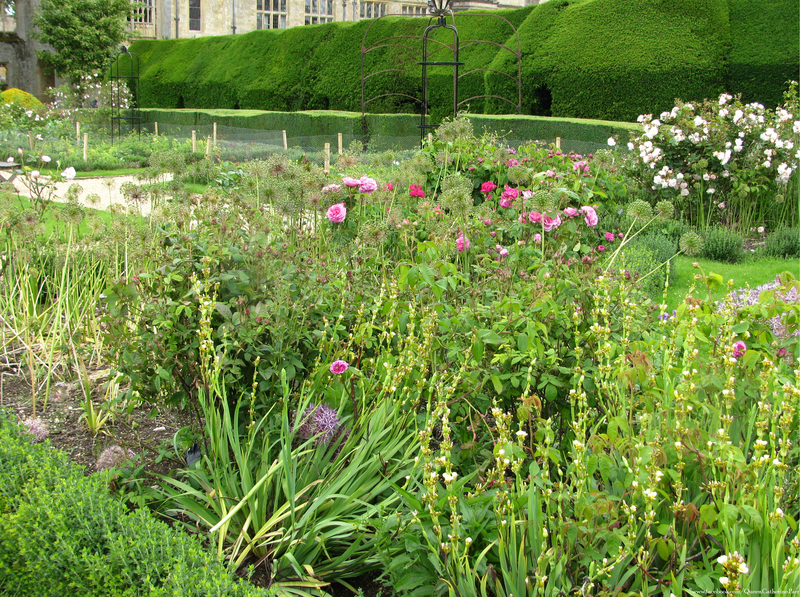 The Queen’s Gardens at Sudeley Castle; Katherine Parr would spend her final days walking with Lady Jane Grey in these gardens. © Meg McGath, 2012. The Queen continued to take the advice of her doctor and walked daily among the grounds of Sudeley, but she was still concerned about the politics and overseeing of the new boy king. On the eve of August 30th, Katherine went into labour. Linda Porter. ‘Katherine, the queen,’ Macmillan, 2012. Susan James. ‘Catherine Parr: Henry VIII’s Last Love,’ The History Press, Gloucestershire, 2008, 2009 [US Edition]. Janel Mueller. ‘Katherine Parr: Complete Works and Correspondences,’ University of Chicago Press, Jun 30, 2011. Emma Dent. ‘Annals of Winchcombe and Sudeley,’ London, J. Murray, 1877. Out of copyright; use of images and info. Meg McGath. “Queen Katherine Parr: The Pregnancy and Birth of Lady Mary Seymour“, WordPress, 29 August 2013. These articles never research the info on Katherine Parr! They always throw Katherine Parr under the bus without even questioning where the info came from and from whom. First off, “young Elizabeth?” Elizabeth during her stay with Seymour and Parr was of age. If her father had cared for her and his country–Elizabeth would have been wed earlier. As the daughter of a King, Elizabeth was seen as a commodity and a political pawn in these times. Her paternal great-grandmother, Lady Margaret Beaufort, was pregnant by twelve and gave birth at thirteen. It wasn’t uncommon for women to be wed by the age of twelve. So to call Elizabeth “young” is a modern day concept based on how we live today. The testimony and the statements accusing Parr of joining in Seymour’s antics came from Kat Ashley (Elizabeth’s governess) who was threatened to be tortured until she spoke up about Seymour and Parr. Katherine Parr had been dead for several months by the time Ashley was arrested and put in the Tower. Ashley knew that women were no longer spared from torture (i.e Anne Askew). The interrogators of Ashley were trying to implicate and charge Seymour after he had tried to marry Elizabeth again and kidnap Edward. Everyone had tired of his lunatic moves to take some power. When Elizabeth was staying with the couple, they were seated at Chelsea Manor–in what is now known as the Royal Borough of Kensington and Chelsea. The Manor was situated on the Thames and was close to several important establishments used by the Lord Protector and his council. At the time Ashley claims Parr was involved in Seymour’s damaging antics. Parr had a HUGE household with a lot of staff on watch. If Parr had participated in these acts, why did no one else contribute, with the SAME story? Ashley was the only one to speak of Parr is such a demeanor. We also have evidence that Ashley encouraged Elizabeth to play along with Seymour. Ashley told Elizabeth that she would be lucky to have such a man. This was ALL done while Seymour was still married to Parr. Evidence also states that Ashley was jealous and had a crush on Seymour — so the weight of her testimony … Is basically worth a grain of salt. Parr never had any inappropriate relations with her stepchildren recorded as described by Ashley. Parr had stepchildren from 1534 until her death in September of 1548. If she was not trustworthy, her second husband never would have left his daughter in Parr’s care. Also, King Henry never would have left Parr in control of everything while he was in France if he believed her to be a bad influence and what not. Her Regency during this time in her reign, could have become a permanent status if Henry had died in France–The behavior fits Seymour, but not Parr. Susan James. Catherine Parr: Henry VIII’s Last Love. The History Press, Dec 26, 2010. Linda Porter. Katherine the Queen: The Remarkable Life of Katherine Parr, the Last Wife of Henry VIII. St. Martin’s Press, Nov 23, 2010. David Starkey. Elizabeth: The Struggle for the Throne. Harper Collins, Sep 25, 2007. Lately on Pinterest I have noticed that a certain portrait has become labeled as a member of Queens Anne Boleyn and Katherine Howard’s family. The woman in the portrait is being credited as their grandmother (or whatever) “Lady Elizabeth Cheney Tilney“. The link used on each pin belongs to The Royal Collection of Her Majesty Queen Elizabeth II and if clicked on — the title is clearly stated as being “Elizabeth Cheyne, Lady Vaux (1509-1556)“. 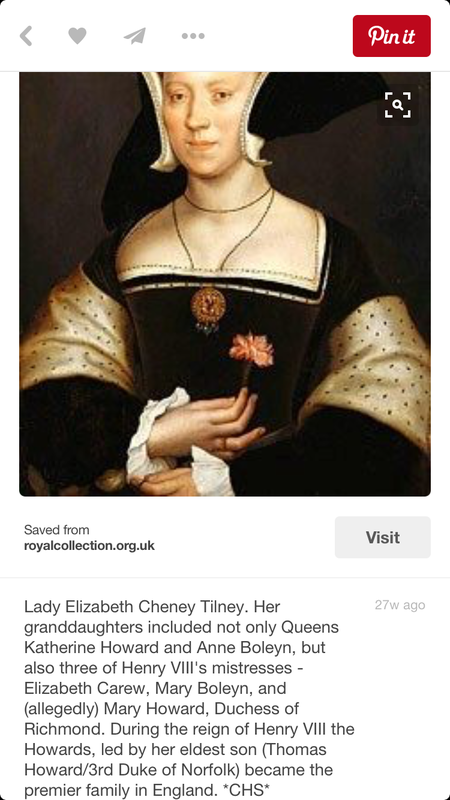 The actual Lady Elizabeth Tilney was born in 1422 as a Cheney, the daughter of Lawrence and Elizabeth Cokayne. Elizabeth married firstly to Sir Frederick Tilney by whom she had a daughter named Elizabeth Tilney. By Lord Tilney, Elizabeth was in actuality the great-grandmother of Queens Anne Boleyn (wife no. 2) and Katherine Howard (wife no. 5). As the widowed Lady Tilney, Elizabeth made a second marriage to Sir John Saye. By that marriage she was also the great-grandmother of Queen Jane Seymour (wife no. 3). Lady Elizabeth Saye (born Cheney) died in 1473. The only daughter of Sir Frederick Tilney and Lady Elizabeth (born Cheney), Elizabeth, married firstly to Sir Humphrey Bourchier by whom she had issue. After her first husband died, the widowed Lady Bourchier became the wife of Sir Thomas Howard, Earl of Surrey (later Duke of Norfolk) on 30 April 1472. This couple was parents to Lady Elizabeth Howard (mother of Anne Boleyn) and Sir Edmund Howard (father of Katherine Howard)–the two doomed queens of King Henry VIII. Will the Real Elizabeth Cheney Please Stand Up? A copy of “Lady Vaux” originally by Hans Holbein c. 1536. This copy was done in 1938. As for the REAL Elizabeth Cheyne (or Cheney)–she was born in 1509; around the time that Anne Boleyn may have been born. Elizabeth was the daughter of Sir Thomas Cheyne of Irthlingborough, an Esquire of the Body to Henry VIII, and Lady Anne (born Parr). Sir Thomas Cheyne (d.1514) was the son of Sir John Cheyne of Fen Ditton (c.1424-1489) and his wife Elizabeth Rempston (born c.1418)–see below for more info. Lady Anne’s parents were Sir William Parr, Baron Parr of Kendal and Lady Elizabeth (born FitzHugh). By her parents, Lady Anne was a paternal aunt to Henry VIII’s last queen, Katherine Parr. In 1516, Elizabeth Cheyne became a ward of of her step-grandfather, Sir Nicholas (later 1st Baron Vaux of Harrowden). In 1523, she was married to Sir Thomas Vaux (later 2nd Baron Vaux of Harrowden); the heir of Lord Nicholas Vaux by his second wife. Now this is where the history of the Vaux and Parr families become extremely confusing to some–Elizabeth Vaux and Katherine Parr’s grandmother, the widowed Lady Elizabeth Parr (born FitzHugh), married secondly to Sir Nicholas Vaux (later 1st Baron) as his first wife. This move was made as a measure to ensure loyalty to the new Tudor King, Henry VII. Lord Vaux’s mother, Katherine, had been a loyal supporter of the House of Lancaster and Queen Margaret of Anjou (wife of Henry VI). Elizabeth FitzHugh, herself, was loyal to the House of York. Her mother Lady Alice Neville was a daughter of Sir Richard, 5th Earl of Salisbury. As such, Elizabeth was a niece of Richard, Earl of Warwick “Warwick, the Kingmaker”. As close family members, Elizabeth and her mother were part of the coronation train of Queen Anne (born Neville) and attended her as ladies afterwards. Elizabeth and Nicholas had three daughters. One was the wife of Sir George Throckmorton, also named Katherine (née Vaux). After Elizabeth FitzHugh died, Lord Vaux married secondly to Anne (née Greene); the maternal aunt of Queen Katherine Parr. By Anne, Lord Nicholas had his heir–Thomas–who married Elizabeth Cheyne. Upon Thomas and Elizabeth’s marriage in 1523, Elizabeth was formally titled Lady Elizabeth Vaux or Lady Vaux. The family tree of Anne Boleyn and Katherine Howard have no such lady with this title. As for Sir Thomas Cheyne–here is where some people may have confused the portrait. Cheyne was of the same lineage as Lady Elizabeth Tilney/Saye (born Cheney), daughter of Sir Lawrence (d.1461) and Elizabeth Cokayne. Thomas’s father, Sir John (d.1489), was Elizabeth Cheney’s brother. So there is a connection there, but the daughter of Sir Thomas was not an ancestress to the Boleyn or Howard family. ‘Elizabeth Cheyne, Lady Vaux (1509-1556)’ c. 1536 by Hans Holbein. Windsor Castle. The Royal Collection of Her Majesty Queen Elizabeth II, 2012–RL 12247. The original sketch was acquired by Edward VI in 1547 after the death of his father, Henry VIII. Henry FitzAlan, 12th Earl of Arundel bequeathed the portrait to John, Lord Lumley in 1580. Lord Lumley probably bequeathed the portrait to Henry, Prince of Wales in 1609, and thus, it was inherited by Prince Charles (later Charles I) in 1612. Charles I exchanged the portrait with Philip Herbert, 4th Earl of Pembroke (the grandson of Lady Vaux’s other cousin, Lady Anne Pembroke (sister of Queen Katherine Parr) around 1627/8. Charles II acquired the painting through Thomas Howard, 2nd Earl of Arundel in 1675. It has been in the Royal Collection ever since. This drawing of Lady Vaux with the companion image of her husband was probably made as a study for a painted portrait. Holbein’s painting of Lady Vaux is known only through copies. No painting of Lord Vaux survives. Henry VIII loved art and collected his fair share of portraits and drawings. There is a painting of ‘Lady Vaux’ at Hampton Court (above) which is said to have been painted by Holbein. It is one of three paintings recognized as genuine by the experts. However, others debate the authenticity and the painting at Hampton is labeled ‘After Holbein–Elizabeth, Lady Vaux‘. Elizabeth is depicted looking to the front, wearing a brown dress with ermine, with a jewel at her bosom decorated with the Madonna and Child enthroned. She holds a pink carnation in her right hand, and a cherry in her left. This is thought to be a competent copy after a lost original by Hans Holbein. The original was painted in 1535. This portrait hangs in the Haunted Gallery at Hampton. The authentic sketch of ‘Lady Vaux’ by Holbein (RCIN 912247) is at Windsor Castle. The only other copy of the painting of Lady Vaux is in Prague Castle Gallery of all places! The portrait of ‘Lady Vaux’ hangs in the gallery at Prague Castle. So, if you see the portrait of Lady Vaux on Pinterest; the caption is incorrect. The fact that people refuse to or do not know how to change the caption is rather sad in my opinion. Elizabeth had no direct connection to the Boleyn or Howard families. Why do I feel like the painting was and still is being labeled incorrectly? My theory: most people do not know anything about Katherine Parr’s extended family; it seems so much easier to associate a lot of things to the Boleyn family for some fans. And when some are called on it, it can get pretty nasty. I’ve had some really nasty comments after leaving my own comment about the true identity of the sitter. For some Boleyn fans, the research, so they think, has already been done. The caption must be correct. No. But who am I? Some random pinner–or so they think. I won’t deny that as a writer on Parr, this whole situation makes me extremely angry. I have been writing for years on this family and just trying to correct a simple image has become tiresome and pretty unpleasant. What really bothers me is the fact that putting the wrong label on a portrait deprives the memory of the real person. To me, somehow that person becomes erased. Elizabeth, Lady Vaux died shortly after her husband on 20 November 1556. She was most likely a victim of the plague which killed her husband. Burke, Sir Bernard. “A Genealogical History of the Dormant: Abeyant, Forfeited, and Extinct Peerages of the British Empire,” New Edition. London: Harrison, 1866. pg 418. ‘Spelthorne Hundred: Hampton Court Palace, pictures’, in A History of the County of Middlesex: Volume 2, General; Ashford, East Bedfont With Hatton, Feltham, Hampton With Hampton Wick, Hanworth, Laleham, Littleton, ed. William Page (London, 1911), pp. 379-380 http://www.british-history.ac.uk/vch/middx/vol2/pp379-380 [accessed 13 February 2016]. A F Wareham and A P M Wright, ‘Fen Ditton: Manors’, in A History of the County of Cambridge and the Isle of Ely: Volume 10, Cheveley, Flendish, Staine and Staploe Hundreds (North-Eastern Cambridgeshire) (London, 2002), pp. 123-124 http://www.british-history.ac.uk/vch/cambs/vol10/pp123-124 [accessed 11 February 2016]. Johnson, Graham and Humphries, Lund. “Holbein and the Court of Henry VIII: The Queen’s Gallery, Buckingham Palace,” London and Bradford, The Gallery, 1978. pg 95-96. This is the work and research of Meg McGath. You may not reproduce or copy this material without written permission.